El Cotillo is known for its nudist beaches – handy if you want to avoid tan marks – just remember to pack the sun cream! For those who wish to retain some modesty and avoid some blushes there is no shortage of other beach locations to enjoy. El Cotillo has some wonderful activities to keep you busy; other than sightseeing on the beaches. Stepping into the surf, you'll find plenty of water sports to take part in, above and below the waves. If you like getting fully submerged there's diving and snorkelling right off the coast, giving you access to the beautiful underwater wildlife of Fuerteventura. The staff at the Dive Inn will give you amazing underwater tours to the best spots around the island, with courses and equipment available for hire. Snorkelling gear is also there for those that only want to dive down a few metres or perhaps are new to underwater exploration. If you fancy keeping your head above water, there are other exhilarating activities that you can take part in. Surfboard, body board and wetsuits are available for hire if you don't have your own and they provide an excellent way to build up an appetite for some of the excellent restaurants and bars found just off the beach front. There's a wide selection of different eateries throughout the resort, including cafes, a few bars and several restaurants, offering local and international cuisine. If you fancy exploring the island a little more, there are hills beyond the beach with cycle and hiking tracks, letting you see the sights of Fuerteventura at your own pace. Of course if you fancy doing things a little faster, there are always car and motorcycle hire options for visitors to use. For other locations in Fuerteventura click here. The Canary Islands are a popular holiday destination, but for good reason. 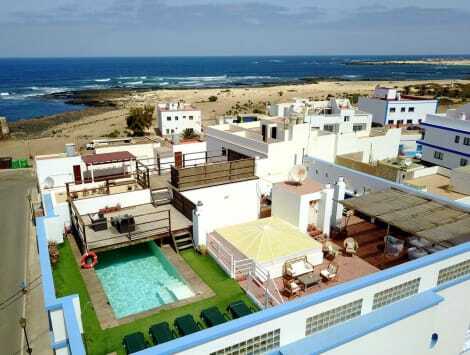 The resort at El Cotillo has almost everything you need. Attractions, activities, wonderful restaurants and beaches to enjoy; whether you're clothed or not. Lastminute.com offers affordable getaways to this wonderful location letting you spend your hard earned funds on some of the wonderful local past times. Start your Spain holiday today.